Wow, here's a movie with a strong pounding rhythm and an original backbeat despite its formula structure. Nick Cannon plays Harlem graduate Devon (off to Atlanta A&T University on a full music scholarship) with strength, determination and an endearing belief in his talent. It's the rebel athlete coming of age story, showing all his skills, except that this athlete is a drummer. No matter, he still falls for the lead cheerleader. Composed tightly with tense competition at many levels. College marching band against college marching band, drummer against drummer, bandleader vs. bandleader. Even within the same band, any player can challenge a "higher" seated member for their position. Within this rigid, nearly military environment, rises slouching-back Devon. A young man who's so sure of his skills with the styx that he thinks the rest of the rules don't apply to him, "Ain't no class gonna teach me how to be me." You'll love his cocky confidence and resolve, but he's got a few things to learn notwithstanding. Cheerleader Laila (Zoe Saldana) tries to redirect his hardheadedness with some hard reality, "It's not about doing what you love all the time." And though he's not entirely right, you've got to like his answer, "See I don't even get that." I loved this film, but I may be biased, I'm a musician and I love percussion. I could listen to a 2-hour drum solo. Not surprisingly, at the end of this film, you'll be in for some heavy snaring replete with splendid cinematography and magnificent musical choreography. The cymbals float like butterflies and the spinning styx sting like bees. I wanted more. "Don't look down when you play your drum, do you look down when you make love?" Good dialogue, good pace, strong performances, direction, acting and momentum. This film gets on a roll and never stops. 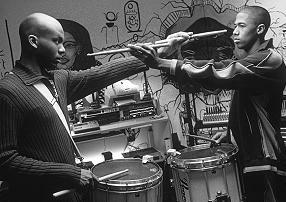 Btw, Though Cannon himself was not a drummer prior to the film ... you'll believe he was. 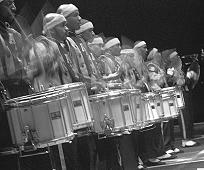 Drumline. Copyright © 2002. Rated PG-13. Starring Nick Cannon, Orlando Jones, Leonard Roberts, GQ, Jason Weaver, Earl C. Potier, Candace Carey, Shay Rountree, Miguel A. Gaetan. Directed by Charles Stone III. Screenplay byTina Gordon Chism, Shawn Schepps. Produced by Wendy Finerman, Timothy M. Bourne, Jody Gerson at Fox 2000.